Powered with a powerful front-facing PixelMaster camera that has a massive 13-megapixel resolution, a f/2.2-aperture and an 88-degree wide-angle lens, the ASUS Zenfone Selfie is all set to capture every moment, perfectly. The unique Selfie Panorama mode is embedded in this phone, which lets you shoot selfies with a view of up to 140 degrees. The rear camera is also a tough competition to the other counterparts. The large f/2.0 aperture lens and the 0.03 second, Laser Ultra-Fast Auto-focus make sure your every photo is picture-perfect irrespective to the lighting. The front, as well as the rear cameras, feature the five-prism Large lenses and the superior grade Toshiba sensors. The camera also offers a dual-LED Real Tone flash technology for brighter pictures even under low-light conditions. That’s not all about the camera features. Beautification mode to create beautified and flawless photos, Super HDR photography that offers brighter and sharper images, clearer macro focusing are some of the features that enhance your digital experience. To help you up your selfie game, the ASUS Zenfone offers features like ZenMotion and Ergonomic Arc design. ASUS understands that the process of unlocking your phone, going to the camera app and tapping on the front camera is way too many steps when you are in the mood for a selfie. So, ASUS introduces the ZenMotion feature. All you need to do is draw an S on the screen, and the phone is all set to capture your beautiful smile. ZenMotion is embedded with the brilliant ASUS ZenUI mobile user interface to enhance the usability and offer a seamless user experience. The Ergonomic Arc design, on the other hand, is designed keeping in mind the difficulty a user faces while clicking a selfie. A rear physical core is placed at the back of the phone. This rear-mounted button not only acts as a shutter button but also doubles up as a volume controller. The button is comfortably placed to offer a hassle-free operation by your index finger. With so many selfie-friendly features, this surely is the perfect phone for the selfie enthusiasts out there. 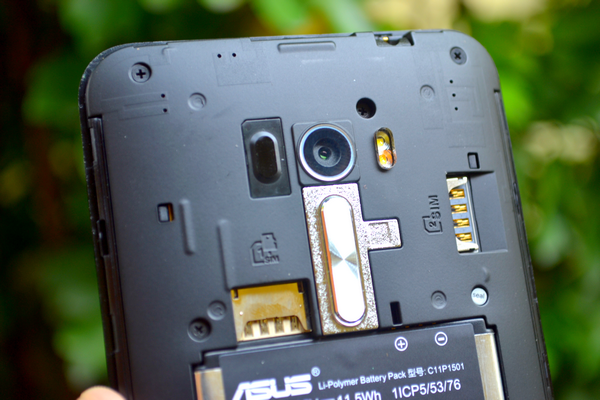 The previous models of Smartphones from ASUS are known for their craftsmanship. Zenfone Selfie is no different, as this phone offers an attractive design that is available in elegant pastels. The signature concentric circle detailing and elegant eggshell finish are the highlights of the Zenfone Selfie. The phone offers an incredibly sleek design that is 3.9mm thin. The ultra-thin edge and the classy colour options make this phone a must-have for all those who seek style with technology. The ASUS Zenfone Selfie exhibits a fast-paced and appealing Smartphone that meets the needs of a fast-paced user. The high-resolution 5.5-inch IPS display with 1920 x 1080 Full HD resolution and 403 PPI pixel density provides an exceptional mobile experience. The ASUS TruVivid technology does not fail to amaze with improved clarity, which offers a splendid visual experience. ASUS Zenfone Selfie comes with Corning Gorilla Glass 4. With this, you can be least worried about keeping your phone with your keys in your pocket. The display is robust to withstand physical damage as the phone offers twice the drop-damage resistance feature. This improves the surface densification and minimizes any chance of lateral cracking. 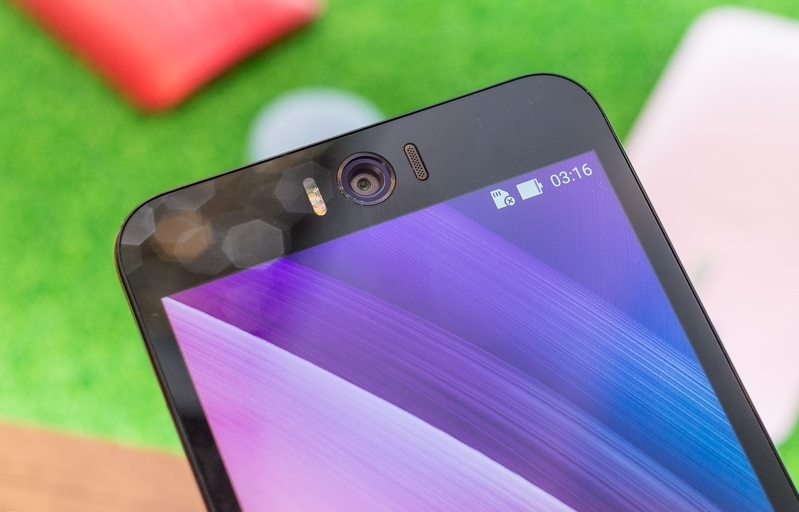 A remarkable battery efficiency supports the ZenFone Selfie's features. Much credit goes to the less power draining Qualcomm’s Snapdragon 615 processor that gives you the most of the battery for constant and regular mobile usage. Own a Zenfone Selfie from the house of ASUS and enjoy a seamless mobile phone experience. It is the perfect Smartphone for users who look for features like fastidious operations, useful functionalities, user-friendly design and uncompromising camera.